Well, the storage space us empty, as are the bookshelves on our old house (in fact, I took the shelves too). The movers were just about able to close the truck, and then they had to tie the bed on to the back of it. I arrived in Antalya with the boys yesterday at noon, Baki with two teeth filled and a two minute egg-timer from his dentist in his pocket. The truck arrived last night, and now all of the stuff is in the flat, having been marched up a flight of stairs by three very determined movers. The flat is a maze of boxes, which threw me into a bit of a panic. Thankfully, my mother was there and she was perfectly calm. She reminded me of how many times we have packed, moved, and unpacked (six big moves in my lifetime alone) and she assured me that there was hope. All I could see was total chaos. One room in the flat has been completely devoured by boxes. 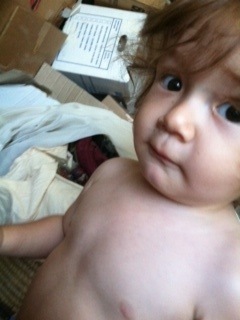 The photo above is one my mother took of Kaya in the mess this morning. Still, moving is always full of little surprises. While I was gathering books that Ali and I had left behind, I came across some old papers of my dad’s — there were three files that he had written, assignments for work; and there was a sheaf of his poetry, a work in progress, with lots of corrections and scribbling on it. I stopped for a moment to read them and was immediately thrust directly into my father’s mind. His voice, not the physical one but the written one, was right there. I felt for a moment that my father, who is so resolutely gone from this world, had been momentarily revived. Nothing can fill the deep chasm that is left when you realize that you will never, ever see someone or speak to them again, but to be able to hear them speak, even if it is not in dialogue with you, is a remarkable, potent thing. It reminded me of how precious a few written words can be. Forget reliquaries full of bits and pieces, the most powerful remains I can think of are words. If you have something to say, for the sake of those you leave behind, write it down somewhere. Write it by hand in a notebook while no one is looking, type a blog post, send a letter. You can direct your words at everyone or no one. I think it’s remarkable how much there is in those three short lists; I feel as if I know her. Your words are a gift, why not be generous with them? The people who mourn you and miss you will be grateful. And the ones who like you now might, too. A lovely post and so nice that you have some of your father’s writings. Such a wonderful find for you and how happy it must have made you. Thank you for the reminder to not just tell those in our lives how we feel about them but to put pen to paper and write it down. The book is widely available, I believe. It is a fine antidote to feeling you have nothing worthwhile to say! Thank you, I’ve scribbled the details of the book down, it sounds remarkable – the list is simply stunning. It’s a lovely book full of quiet revelations. A great example of how something executed in a modest way can turn out to be a giant in the end. What a lovely gift from your father – they seem to find us when we most need them, don’t they? It’s true – the timing was just right. I hadn’t really thought of that, so I’m glad you pointed it out.